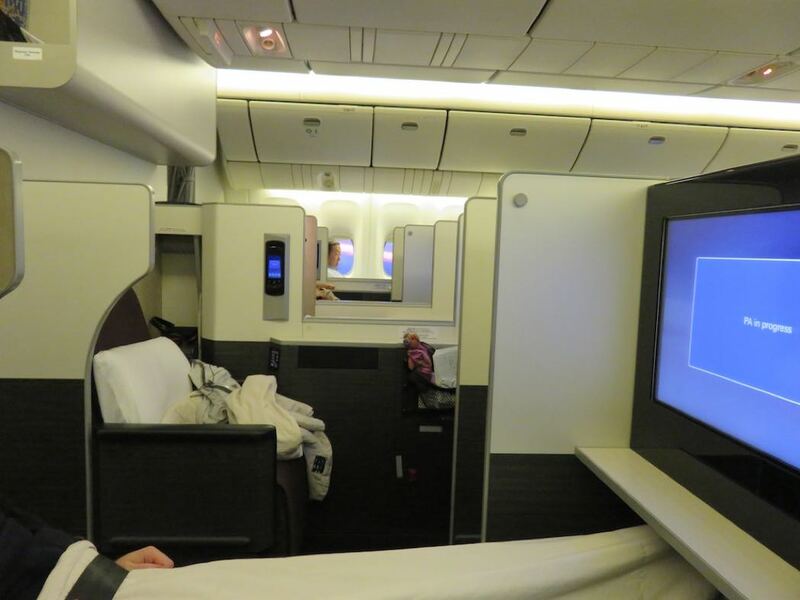 I flew Business Class in a Boeing 777-300ER on Japan Airlines (JAL) from London’s Heathrow Airport (LHR) to Tokyo’s Haneda Airport (HND) in Japan in June 2016. The airport lounge I was given access to was the British Airways Galleries lounge in Terminal 3. 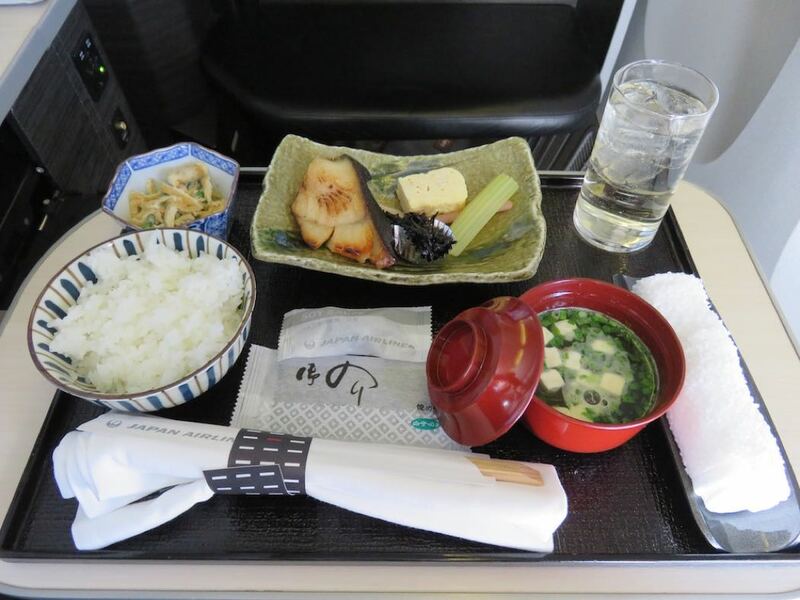 JAL ranks amongst my preferred airlines for Business Class. 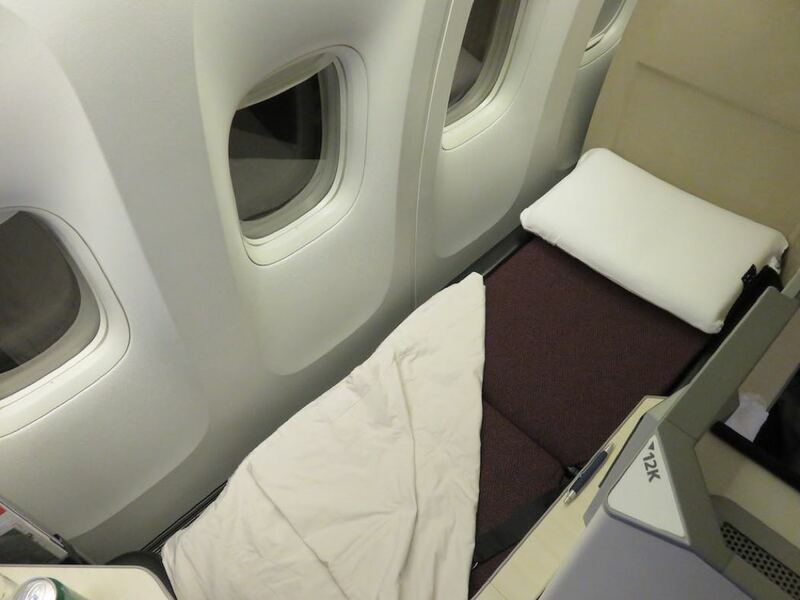 The seats are located in their own cocoon with high walls (earning them the designation ‘JAL Sky Suites), the flatbed is almost as good as in First Class, and the food is mouthwatering. The cost of my Business Class ticket was 1349 euro, including taxes, for the roundtrip from Brussels to Tokyo via London. That’s less than half the normal price, and in the range of a flexible Economy Class ticket. 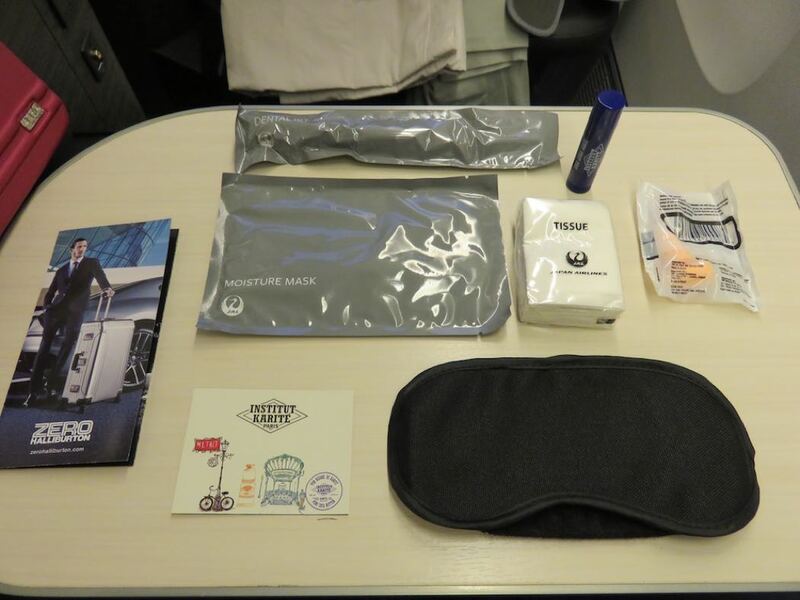 The flight was booked as a British Airways ticket (JAL codeshare) during a British Airways promotion. 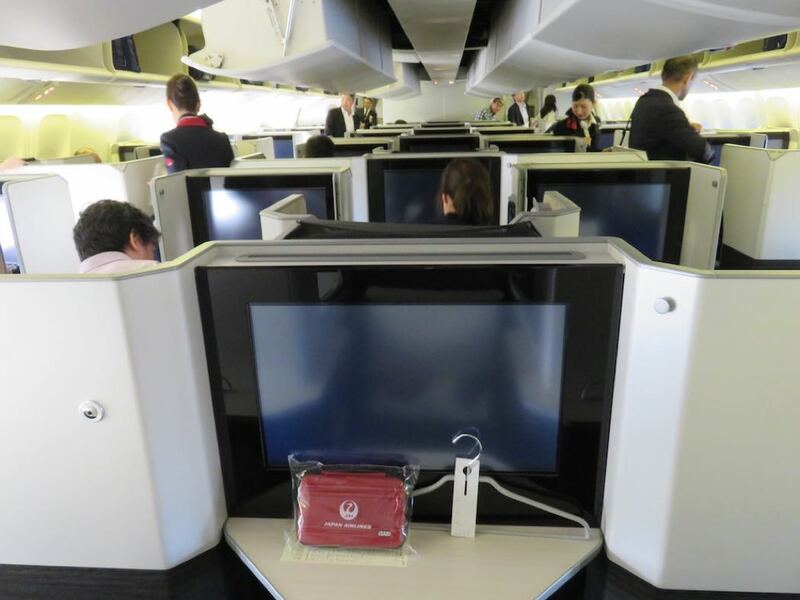 JAL’s Boeing 777s come in several versions, but currently, there’s only one cabin layout for the Boeing 777-300ER, which is mainly rostered on the international routes from Japan to Europe and the United States of America. From the front to rear, there are 5 cabins: the First Class cabin (which seats 8 passengers), a Business Class mini-cabin (which seats just 7 passengers), a large Business Class cabin (with 42 seats), Premium Economy Class (with 40 seats) and a large Economy Class (which seats 147 passengers and has a galley in the middle). Business Class seats in JAL’s Boeing triple seven are placed in a staggered 2-3-2 layout. All seats face forward and all of them have direct aisle access, except for the middle seat in each row. The cabin itself features a modern and contemporary decor, with mainly white and light grey colours that somewhat contrast with the pink colour of the seat cushions. The checkered pattern of the cloth on top of each seat adds a subtile Japanese touch to the overall warm cabin ambience. The seat itself is very comfortable, albeit a tad narrow with a width of 25,5 inch (65cm). In front of each seat, there is an ottoman below a generous 23-inch (58 cm) LCD entertainment screen (one of the largest in its class) and SONY background noise-cancelling headphones. On one side of the seat, you find the remote control for the inflight entertainment screen as well as the controls to adjust the seat’s position. At the press of a button, the seat can be lowered into its horizontal position to create – together with the ottoman – a fully flat bed. 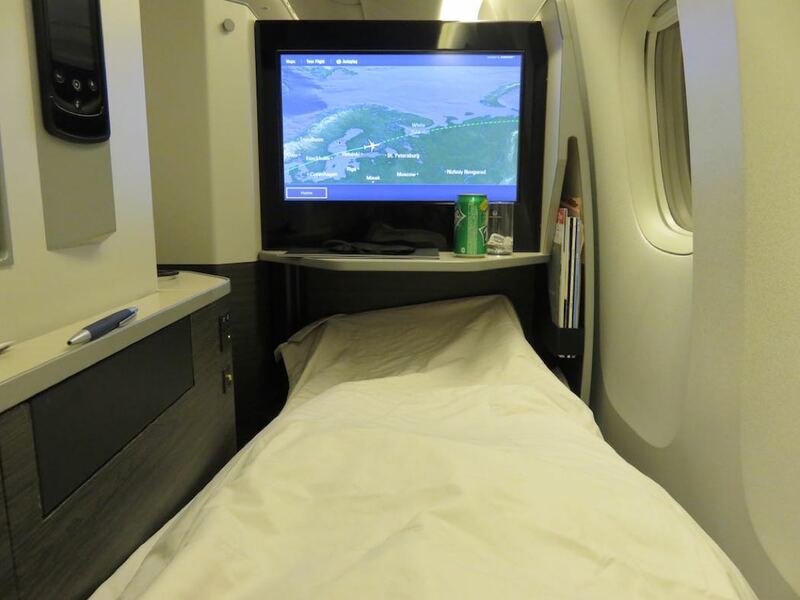 Upon request, the crew provides a highly resilient airweave mattress, and a firm pillow and blanket which will send you off to dreamland even if you are like me and have trouble falling asleep on a plane. There are retractable privacy dividers between the seats, which can be lowered when you are traveling with a companion. It’s a somewhat similar system to the one you find on British Airways’ planes, although JAL’s staggered configuration means that you never directly face the passenger seated next to you (which is the case with the British Airways Ying/Yang seat plan) and as such, you won’t encounter moments of awkwardness when the screens are lowered by the crew. Although the seat itself is very comfortable, it has to be noted that the entrance to the suite – if you are seated in a window seat or the middle seat is very narrow. Another issue with the window and middle seats is that at first sight, they seem to lack a decent storage compartment, except for the overhead bins and the space below the ottoman (all other seats have an extra storage compartment on their side). It’s only after I landed in Tokyo that I found out that these seats do have in fact a large extra storage compartment somewhat hidden behind the headrest. I wish I had found out about this before I took off, since I struggled throughout the flight to store my belongings. 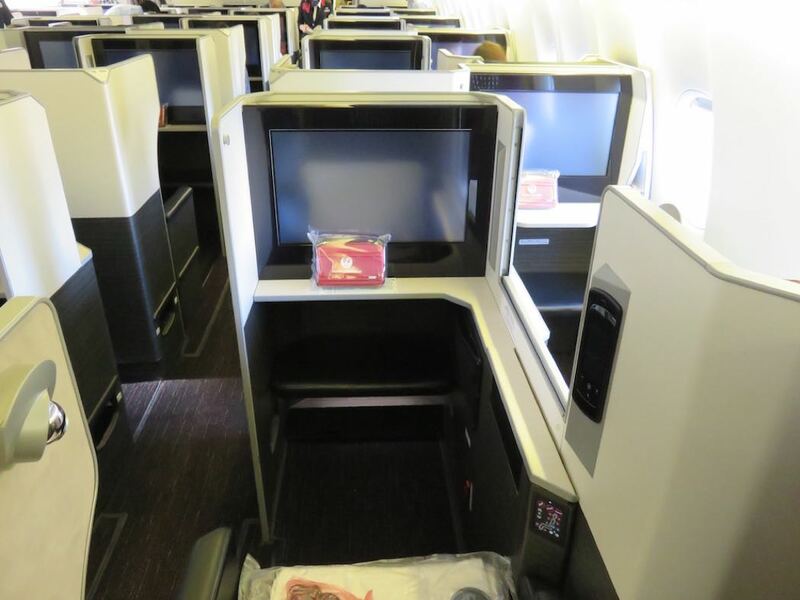 What are the best Business Class seats on JAL’s B77W? 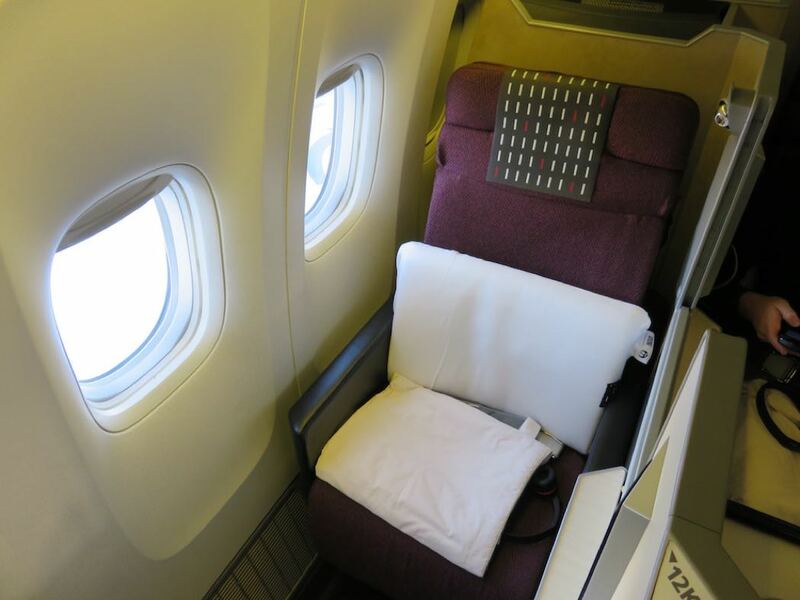 Seats in row 5 are located in their own private cabin, which offers a more intimate ambience. Solo travelers should go for the window seats. The 3 middle seats are ideal for passengers traveling with a child. 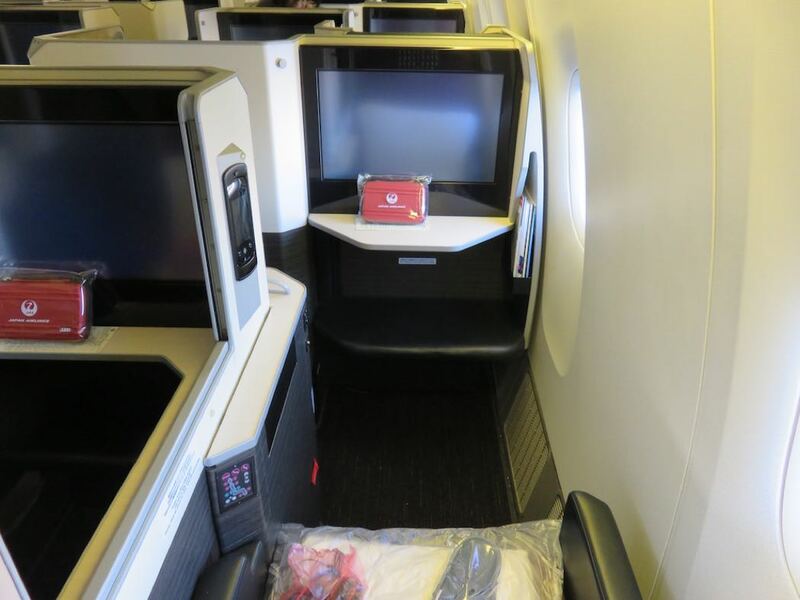 What are the worst Business Class seats on JAL’s B77W? It is worth noting that window seats and middle seats have a narrow entrance which can make getting in and out of them tricky. Windows seats in row 11 miss a window and are best avoided. Passengers seated in row 7 may be occasionally troubled by some noise because of this row’s proximity to the lavatories and galleys. JAL offers its Business Class passengers a very nice amenity kit in a red case, designed by manufacturer Zero Halliburton. It contains all the essentials such as a moisture mask, lip balm, eyeshade, earplugs, tissues, toothbrush, and toothpaste. 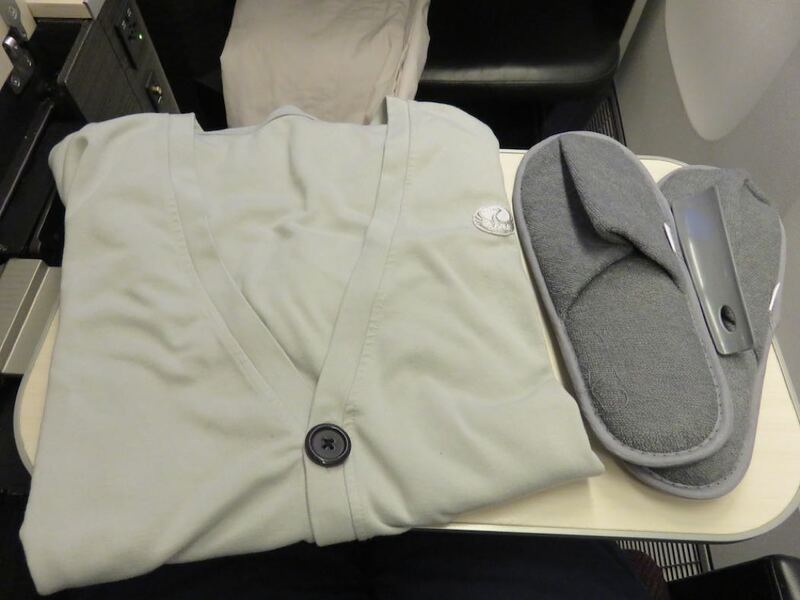 A very nice touch is that Business Class passengers are also offered a pair of slippers and a cardigan. Onboard cuisine was the surprise on this flight, as it was by far the best food – both in terms of presentation and taste – I ever had in all my years of flying Business Class. The stylish menu featured a la carte dining with a Western and Japan multi-course dinner to choose from. My friend had the Japanese menu, while I enjoyed the Western menu. King prawn with white miso jelly, sweet vinegar jelly, and chopped okra. One of the great things about JAL is that you can order your meals from the a la carte menu by tapping the controller, in any order, at any time, and as often as you wish. 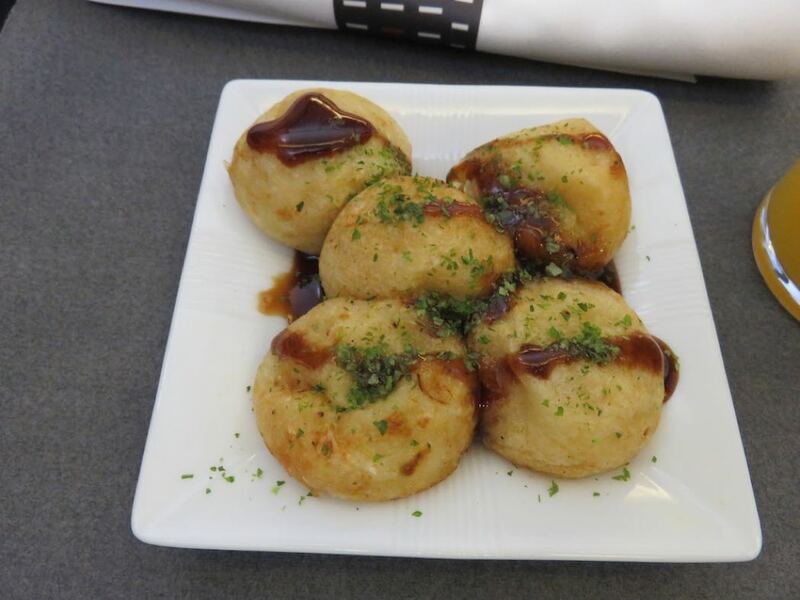 Apparently, I was hungry since I ordered several snacks during the flights, such as octopus fritter balls (a famous street snack from Osaka) and Japanese seafood curry (see pictures below). 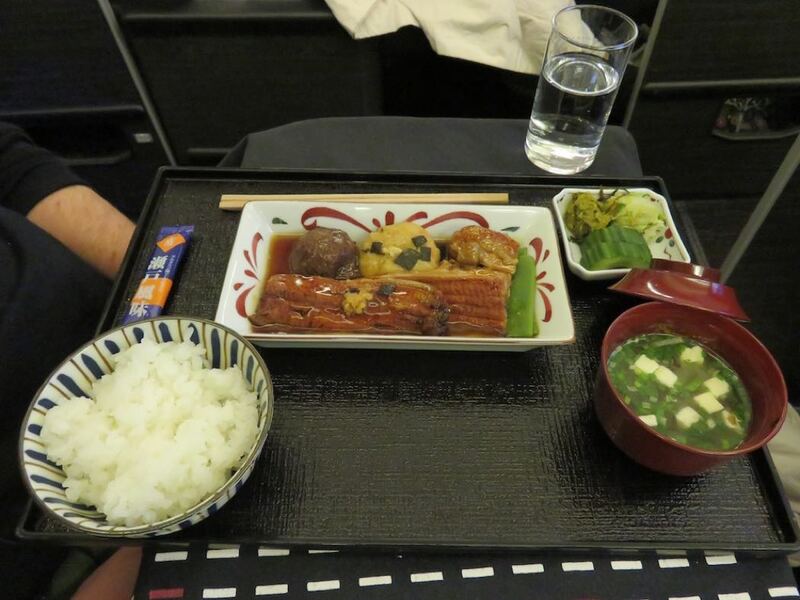 In addition, I also had the Japanese breakfast before landing, which consisted of grilled black cod, egg cake, French bean & fried bean curd dressed with sesame, and miso soup. Delicious! JAL does not have a walk-up bar on its Boeing 777 planes, but that’s not a problem at all since you can order several snacks from the menu at any time you wish. JAL does offer fee based WiFi on its Boeing 777 airplanes, although I did not try it out. The flight path took us over the northern parts of East Russia and Siberia, flirting with the coast line along the way. Although we took off during sunset, the sun rose again after only 3 hours of flying because of the arctic summer. 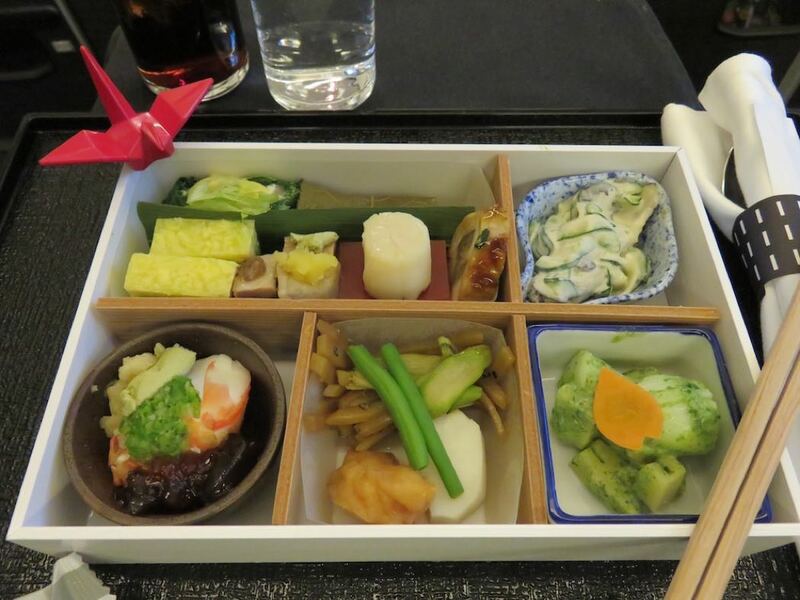 For comparison, you can read my other Japan Airways Business Class flight reviews.